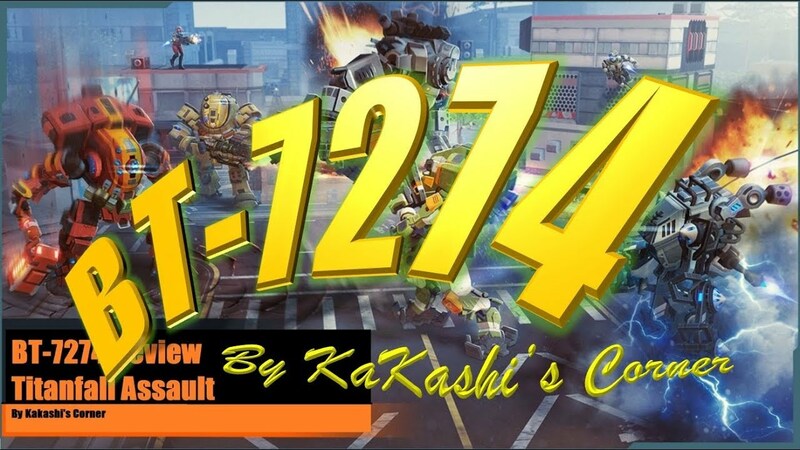 Its KaKashi here from KaKashi’s Corner and today I’m doing a review on the new vanguard legendary titan called BT-7274. BT-7274 has n medium health pool with a shield that makes him a bit tankier against human dps but more vulnerable to arc damage. BT-7274’s energy cost is higher than any of the other legendary titans at 8 energy as the core legendary titans energy cost is 7 energy per use. BT-7274’s base stats are quite low compared to the other legendary titans – on paper making him one of the weaker legendary titans. His skill ability is very powerful but it does require good timing and placing him in the right spot at the right time for him to be very effective – if you get this right he can have a snowball effect and have a very good paying for the energy spent. On the other hand some of the other core titan’s skills are more dependable compared to BT-7274 such as core scorch with its massive AOE damage and the core ogre with the highest single target human and robotic dps for in the game with a massive health pool and core shield that can trigger multiple times per single use. Core Ogres core shield itself has more HP than a stryder. Core Scorch and Core Ogre’s base attack damage is higher than BT-7274’s. BT-7274 does have a range and speed advantage above Core Scorch and Core Ogre giving him a slight edge if you deploy him using the correct timing and placing. A strategy that I like is deploying 2 reserve titans or an ogre to tank in the frontline while BT-7274 serves as long range artillery delivering the punishment from afar. When titans are close to death the health bar displays a chevron that runs out in 10 seconds or when it is destroyed with damage before they die. This is known as a doomed titan. BT-7274 executes doomed titans instantly which is a powerful skill mechanic which allows him to do massive damage within an instant of executing a titan and giving a very high return on energy investment. BT-7274 has an alternating base attack switching from high human dps rounds to an arc beam and shooting rockets from his shoulders. This arc beam does high damage to robotic enemies and structures with a high attack rate. The additional rockets do AOE damage but the AOE damage is relatively low. The whole thing is a beautiful spectacle and fun to look at with some badass animations. He is very fun and engaging to play with demanding a lot of your focus to deploy him strategically in order to get the most value out of the energy spent on him. There has been multiple battles where I have executed up to 5 doomed titans with a single BT-7274 having is very efficient energy use. Please enjoy the footage I have of me kicking *** with BT-7274 and as always have FUN.